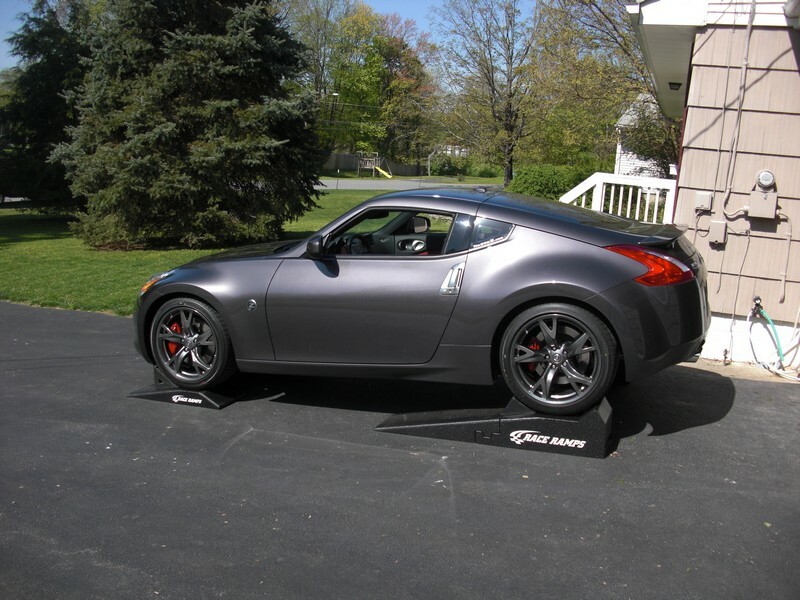 What are all you lowered Z's using as far as ramps go ? Ive got my 370Z lowered on H&R Springs with some carbon fiber side skirts and oil changes arent as easy as before because there is barely any clearance to the jack points. 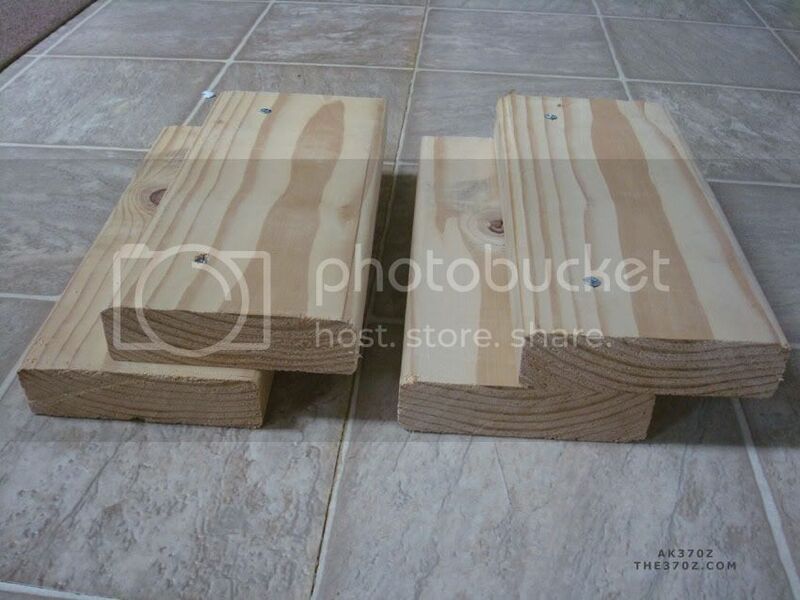 I was looking into purchasing a set of Race Ramps and im not sure if theyll work, anybody out there got these working on their lowered Z ? My Z isn't lowered but I still scratched my front bumper on my Blitz ramp. 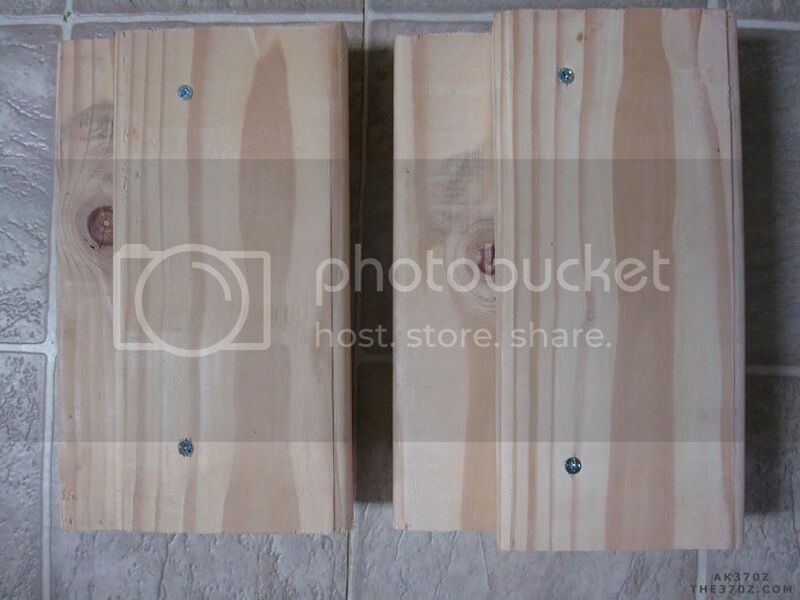 So, I made a wooden step(I am still working on it) and it works pretty good. I don't think I want to spend 200-400 dollars on race ramp though I'm sure they are worth the money. My BlitZ ramp cost me $30 (or even less) from Pepboys 4 years ago! Width of the wood: 1.5"
Make sure you secure that adapter to the ramp itself when in use. I too made my own adapter for my rhino ramp. not sure but HR lowers the car quite a bit... Might want to drive up onto some 2x4's and use a lift and jackstands. I've got the race ramps, and it clears just fine even without the race ramps roll ups. No boards necessary. Although, I am NOT lowered. You can get the extended version for very low vehicles. They are expensive, but they will last forever. They are very well constructed, light weight, etc. Makes the blitz ramps look...well like $30 ramps! Do you own a 40th anniversary? Join the club! Last edited by dropped1; 05-26-2010 at 11:27 AM. I've also got the Race Ramps (but my Z isn't lowered), and the lower air dam clears fine. I love, love, love, love, love, love, love, love, love, love, love, love, love, love, love, love, love, love...I can't say enough, my Race Ramps! P.S. AK, you're scaring the hell out of me, and it is obvious that instead of a beer fund, we need to start a Race Ramp fund for you. Why I NEVER say NO to the Panda Lou Fusz!!! I may lower in the future, so I will likely get the 67" XT 2-piece and be done with it. But if you're in doubt, definitely do their test with the yard stick. I'm going to store my Z in the winter, so I'll get a set of the Flatstoppers too. Dropped: do you find the small ramps under your front tires actually practically useful? They just looks so low to the ground still. Great photo, BTW. Last edited by shadoquad; 02-09-2011 at 02:37 PM. haha .. I only lift the car 3 times a year (3 oil changes) therefore I never really thought about spending money on this though they look really good. I did mine extractly the way you did it and it works grat. But I am really worried after I lowered my car whick will be my first mod. Terrific to deal with, pricing excellent and Fred the owner gets them to you at super sonic speed. I've bought from him twice now and he is good to deal with and an excellent communicator. I second this, just got my Race Ramps from Fred @ Reverse Logic. Great price, solid customer service, shipped same-day. As for the ramps, they are fantastic. I got the 2-piece 56" ramps. The ability to remove the lower portion of the ramp after the vehicle is raised gives you a ton of room to work. And the long ramp area gives great feedback to the driver as you drive up the ramps.